The Kitakyushu Central Library in Japan, Arata Isozaki's native country. Construction on the library was completed in the mid-1970s. "It was in complete ruins, and there was no architecture, no buildings and not even a city. Only barracks and shelters surrounded me," Isozaki, now 87, recalls in a recorded statement. "So, my first experience of architecture was the void of architecture, and I began to consider how people might rebuild their homes and cities." Isozaki won the Pritzker Architecture Prize on Tuesday, a lifetime achievement award so prestigious, it's often known as the Nobel Prize for architects. 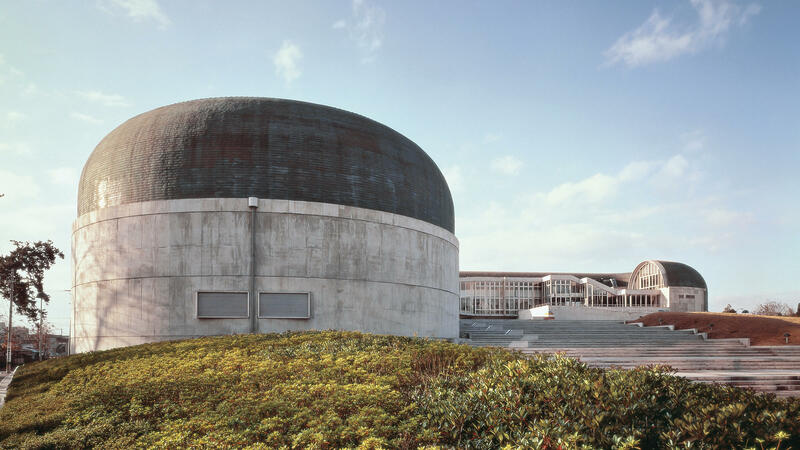 And according to the prize's judges, it was in part Isozaki's endless attempts to rebuild — to make something new from old forms, to experiment on the edge of what's possible — that earned him the honor. 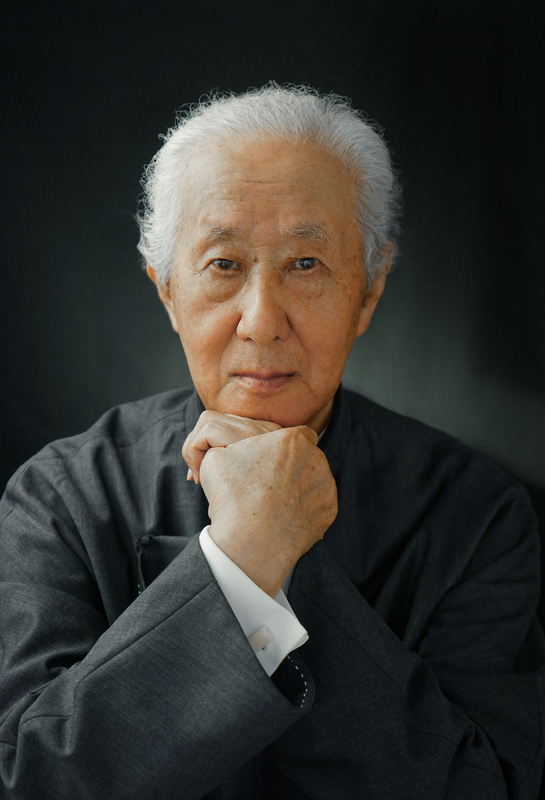 Arata Isozaki, winner of the 2019 Pritzker Prize, poses for a photograph. Isozaki is the eighth Japanese-born architect to win the prestigious prize. "Clearly, he is one of the most influential figures in contemporary world architecture - on a constant search, not afraid to change and try new ideas. His architecture rests on profound understanding, not only of architecture but also of philosophy, history, theory and culture," reads the citation of the Pritzker jury, which was chaired this year by U.S. Supreme Court Justice Stephen Breyer. "He has brought together East and West, not through mimicry or as a collage, but through the forging of new paths." Isozaki's best-known works span the globe — from Tokyo to Milan, from Los Angeles to Doha, Qatar. They include the Shanghai Symphony Hall, a curving saddle of a building in the midst of the Chinese metropolis, and the Center of Science and Industry, a gently bending fixture of Columbus, Ohio. In Barcelona, his Palau Sant Jordi arena became a major venue at the 1992 Summer Olympics. And in more than a quarter-century since those Olympic Games, the massive structure has played host to some of the world's biggest athletes and celebrities — even as it came to be a star in its own right, frequently featured on postcards of the Spanish city. The Palau Sant Jordi, an indoor arena designed by Arata Isozaki that was used for the 1992 Barcelona Summer Olympics. But, as the jury noted, Isozaki was not selected for his buildings alone. "He has set an example of generosity," its citation added, "as he supports other architects and encourages them in competitions or through collaborative works." David Gauld, an architect based in New York City, was among the younger practitioners whose careers Isozaki helped foster. Gauld studied under the Pritzker laureate at Harvard University and worked directly with him for years afterwards. "He's my mentor," Gauld says, "and in many ways, my hero." "He doesn't have a signature style. Like, some architects do a similar kind of style or look no matter what what the project is, no matter what the program is and no matter what the site is. Their buildings have a kind of similar look," Gauld says. "It was always [Isozaki's] approach to do something specific for the site, for the program. And so, consequently, no two of his buildings look alike." Case in point: LA's Museum of Contemporary Art, which Isozaki designed in the 1980s. The museum's director, Klaus Biesenbach, who calls the building "a jewel out of its time," says the brilliance of the structure resides at least partly in how well suited it is, both to its environment and to the artworks it houses. "So I think it's actually a very LA piece, because it has this sunken pool quality, with beautiful skylights, but it's also a very much dedicated to the art that this museum is famous for," Biesenbach explains. 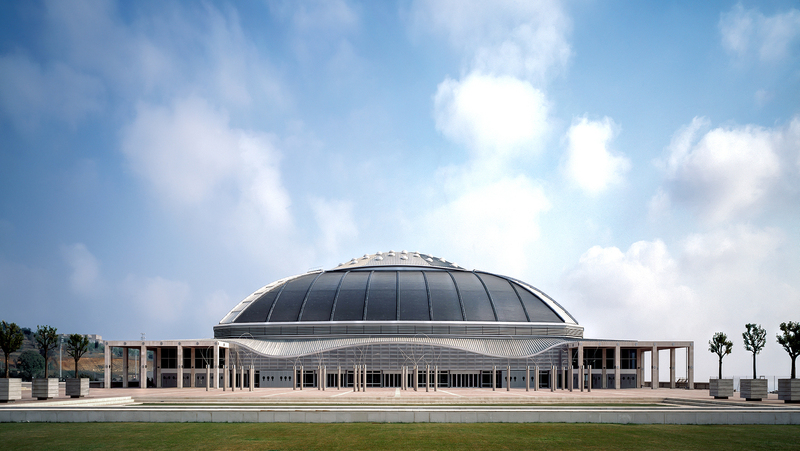 Isozaki becomes the eighth Japanese architect to win the Pritzker since it was founded four decades ago. Along with the honor, he receives a bronze medal and a $100,000 grant. Below, you can find a brief gallery of some of Isozaki's most recognizable works — structures plucked from a body of work spans roughly six decades. "He never merely replicated the status quo but challenged it," the Pritzker jury writes. "And in his search for meaningful architecture, he created buildings of great quality that to this day defy categorizations, reflect his constant evolution, and are always fresh in their approach." 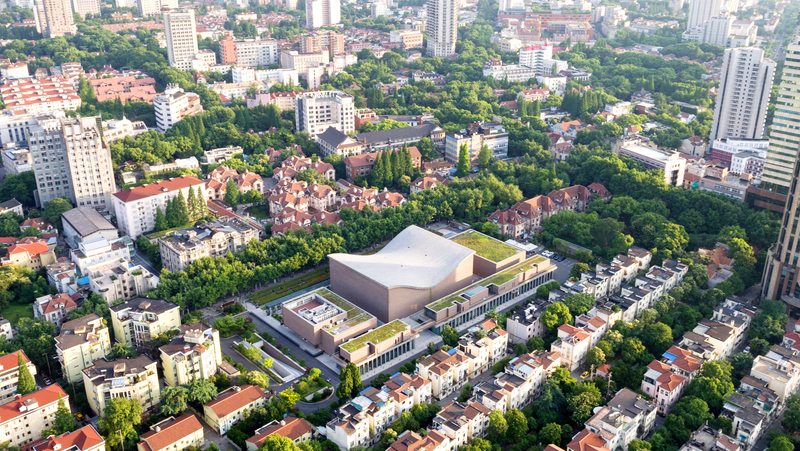 The Shanghai Symphony Hall (center) sits like an outsize saddle in the midst of the Chinese metropolis. The concert venue opened just a few years ago. An interior view of the Oita Prefectural Library, which Arata Isozaki designed. Return to the top of the story. The Pritzker Architecture Prize is the biggest award in the field. It's often called the Nobel Prize of architecture. This year's winner was announced this morning. As NPR's Andrew Limbong reports, it's someone who knows what it's like to be without any architecture at all. ANDREW LIMBONG, BYLINE: When Arata Isozaki was a kid growing up in Japan, he was surrounded by the destruction of World War II. His hometown burned. Across the shore was Hiroshima. Here's how he tells the story in a video announcing his Pritzker win. LIMBONG: "Surrounding were no buildings, no architecture. There was not even a city. There was only a ruin." This was the beginning of Isozaki's search for what he calls meaningful architecture. It's a search that still continues at the age of 86. In fact, the Pritzker jury awarded him the prize in part because he's never settled on a single approach to his work. DAVID GAULD: He doesn't have a signature style like some architects. LIMBONG: That's David Gauld, a New York-based architect who's known Isozaki for over 30 years. GAULD: He's my mentor and in many ways, my hero. LIMBONG: Gauld says Isozaki approached every project, every site with fresh eyes. GAULD: Consequently, no two of his buildings look alike. LIMBONG: Take, for instance, two of his American works, starting with COSI. That's the Center of Science and Industry in Columbus, Ohio, on which Gauld worked with Isozaki. It's a huge building, one that Doug Buchanan, who works as the VP of membership and marketing there, can often spot when he's flying over the city. DOUG BUCHANAN: It has these enormous concrete wings that stretch off into the distance when you enter the building. And you enter under a multi-story-tall gold cylinder that actually contains - inside it is Ohio's largest planetarium. LIMBONG: And if you look at the building from the back, you can see the curved wings envelop a part of Columbus history. BUCHANAN: Isozaki actually wrapped the arms of COSI around Columbus' historic Central High School, which was built in 1924. And it's a perfect addition to incorporate into a science museum because it's a school, and science education is central to what we do. LIMBONG: Compare that with the Museum of Contemporary Art in Los Angeles. 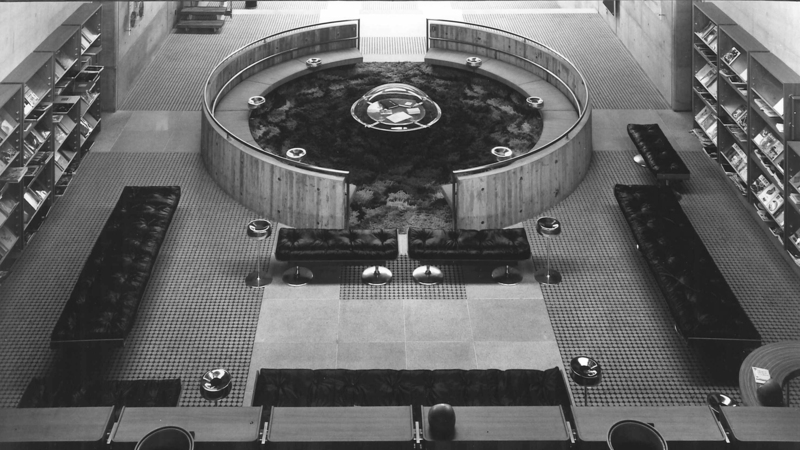 MOCA, as it's known, was finished in 1986. It's a low building, much lower than the downtown LA high-rises that surround it. It's also red, made of sandstone, which pops against the glass and steel of the rest of the neighborhood. Klaus Biesenbach is the museum's director. KLAUS BIESENBACH: It has these beautiful skylights and pyramids that brings the light from the outer world into the museum. But it's also very much dedicated to the art that this museum is famous for. LIMBONG: Past the ticket office on street level, you walk down to get into the museum's galleries. BIESENBACH: What Isozaki so brilliantly did with MOCA is that he used a very Los Angeles motifs of pool. It's like a sunk in pool. LIMBONG: Arata Isozaki has designed museums in Spain, Japan, Italy. He's seen more than a hundred of his designs actually built, including an Olympic arena, an inflatable concert hall meant to tour places hit by disaster, a high school in his hometown which has been rebuilt since the war. In much the same way out of the ashes of destruction, Isozaki built a career in architecture. LIMBONG: "This was the start of my life in architecture." Isozaki himself might have grown up without buildings to look at and learn from, but he's making sure that isn't the case for the rest of us. Andrew Limbong, NPR News. (SOUNDBITE OF ARCHITECTURE IN HELSINKI'S "ESCAPEE") Transcript provided by NPR, Copyright NPR.